You don’t want to drop your iPhone. The iPhone X is expensive. The price starts at $999. The iPhone X is delicate. The edge-to-edge glass in the front and back doesn’t help withstand scratches or drops. The iPhone X is expensive to repair. The screen replacement for an iPhone X costs $279. Or you can buy AppleCare+ for $199, and then pay $29 for a screen repair. The best solution for protection? 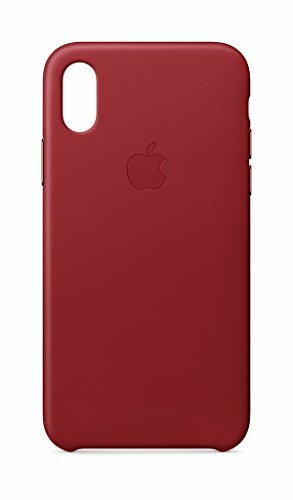 Buy a case for your iPhone X. You want the case to be protective but not bulky. Your iPhone X is good looking, so should your case. 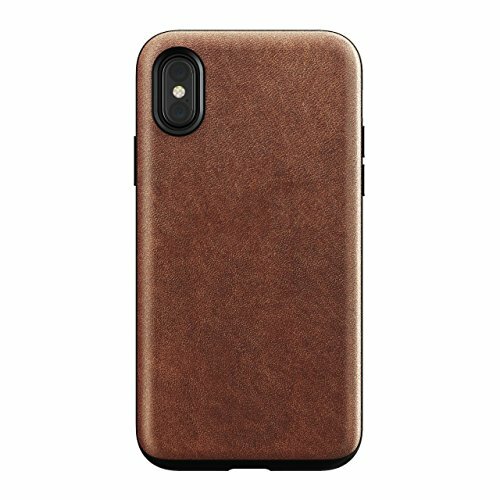 I recommend leather cases for your iPhone X. They look and feel more premium than silicone or plastic cases. Leather cases can’t offer you the military-grade protection like other heavy-duty cases, but they are protective enough for everyday use. 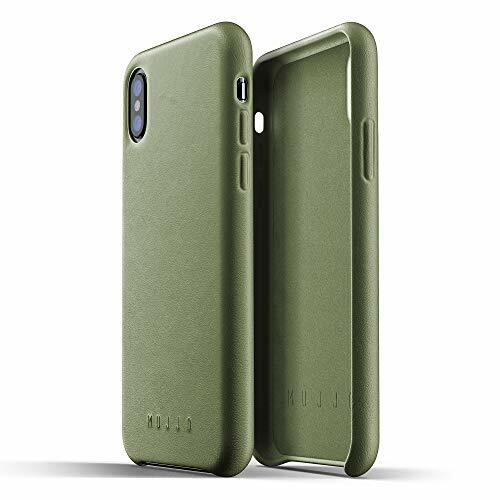 The iPhone X cases on the market have different designs and features. 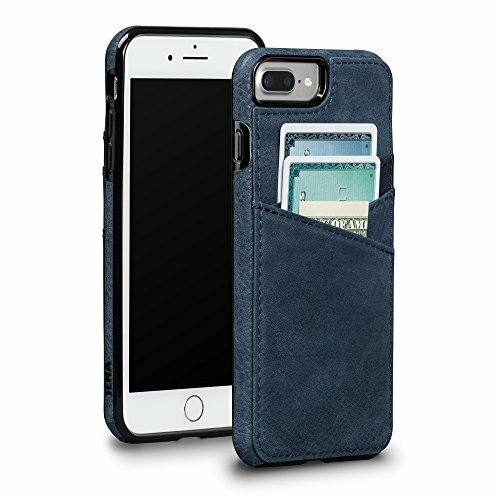 While the styles of leather cases vary, you may want to consider the following factors before buying a leather case for your iPhone X.
Genuine/PU leather. You can find leather cases for iPhone X made of these two materials. PU leather isn’t real leather, but a high-quality PU leather case looks and feels very similar to an iPhone case made of genuine leather. A PU leather case is much cheaper than a genuine leather one. However, a premium leather case has a smooth texture and a rich character as it ages. While a genuine leather case is more expensive, the luxury is sometimes worthwhile. Full coverage. I prefer all-around cases. They offer overall protection. Some leather and polycarbonate cases have openings for the bottom and/or buttons. These uncovered areas are susceptible to scratches. Some cases don’t fully cover the top edge, thus exposing your phone to damage to the screen. Raised front lip. Apple published an accessory design guideline. It states that “exposed glass on the Apple device must not come within 1 mm of a flat surface, such as a table or floor, in any orientation when the case is attached”. The raised lip around iPhone’s edges prevents the screen from scratches when you place the phone screen-down. Aesthetic appeal. Different iPhone users have different aesthetic preferences. My picks of iPhone X cases have minimalist and elegant designs because they appeal to a wider range of iPhone users. Folio or not? I prefer slim iPhone cases. A folio case (a case with a front cover) gives you the convenience of carrying cash and cards but adds bulk to the iPhone. The iPhone X in a folio case not only looks thicker but also feels heavier in hand. Again, this is only a personal preference. A folio case is bulkier than a standard case, but may not be as bad in everyday use as you expect. What makes the Nomad’s case stand out is the full-body protection. The Nomad case covers all the edges unlike Apple that leaves the bottom of the iPhone X exposed. Nomad makes practical and minimalist cases, and their iPhone X cases are in line with their reputation. The futuristic-looking case resembles the Apple Leather Case. What makes the Nomad’s version stand out is the full-body protection. The Nomad case covers all the edges unlike Apple that leaves the bottom of the iPhone X exposed. The full coverage makes the Nomad case more protective. The full coverage makes the Nomad case more protective. Nomad uses high-quality leather from Chicago’s Horween Leather Company. The case will develop a rich patina over time, which is a unique feature for leather cases. The specially engineered buttons won’t distract your attention from the case, but give you a tactile experience when you press the volume and power buttons. The raised edges protect iPhone screen from scratches. The cases have two versions. The first is the Rugged Case. It sells at $44.95 and doesn’t have card slots at the back. The second is the Wallet Case. The price is the same, and adds two card slots at the back and carry 2-4 credit cards. Pleasant to see and touch, the case is specifically handcrafted for the iPhone X.
Mujjo leather cases are pleasant to see and touch. They are sleek, smooth and pragmatic. The premium full-grain leather is soft to touch. The case grows a unique character as it develops a patina with use. The interior uses the finest microfibre fabric for comfortable padding for the iPhone X. The full leather case offers complete body protection. The case is specifically handcrafted for the iPhone X. The cutouts for the camera lens and mute button are curved inward to add a smoothness to the look. The bezel rises 1 mm above the glass edge to the screen from scratches without adding extra bulk. The cases come in rich color tones: olive, tan, black and grey. The tan and olive leather models are the perfect shades of brown and green. You can choose a plain or wallet leather case. The wallet case has a slanted pocket at the back, and fits 2-3 credit cards. Using this thin case is not the ideal option for impact protection, but the comfort of style and luxury is worth the comprise. 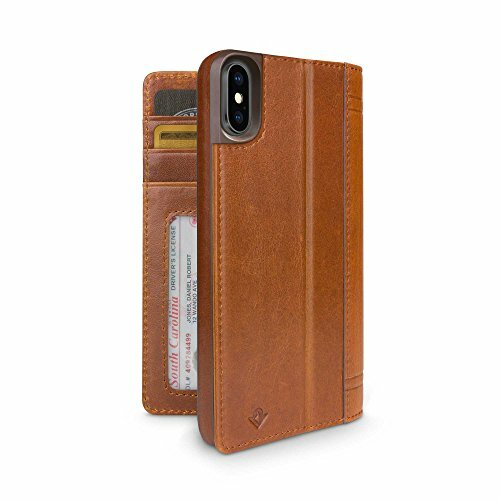 Apple’s iPhone X Leather Case is a high-quality cowhide protector for the iPhone X. The case looks great and feels thin and light. It covers most of the phone’s body to guard against most scratches and minor drops. The lip is also adequate to protect the screen. The leather case is available in nine colors. The price is high but not unreasonable. Using this thin case is not the ideal option for impact protection. But the comfort of style and luxury is worth the comprise. Starting with the iPhone 7/8 and 7/8 Plus, Apple added aluminum button covers into the leather. The button covers add a nice color accent to the leather and give you a responsive tactile experience when you click them. The well-designed size and shape make the buttons easy to be found. The patina that worn leather develops is more aesthetically appealing to some people. The downside is that it exposes the bottom edge of your iPhone X. This means that the front bottom edge and the area around the Lightning port are more prone to impact damage if you drop your iPhone. Apple has been using this design for several generations. So it’s less likely to see a change anytime soon. The well-done stitching work showcases the fine craftsmanship of the case. The reinforced structure, as well as the raised bezel, makes the case protective from casual drops. The Lugano Wallet Case features a shock-absorbing core wrapped by premium leather. The well-done stitching work showcases the fine craftsmanship of the case. The reinforced structure, as well as the raised bezel, makes the case protective from casual drops. The case securely locks your iPhone X, and yet it is easy to remove the phone from the case without much effort. The buttons are very tactile, so you won’t have any difficulty pressing them. The cutouts around the mute button, Lightning port and speakers are precise. So your iPhone X is less exposed to scratches and scruffs. The downside is that the case slightly bulkier than its competitors. The card pockets can hold 3 cards. The folio case covers all the iPhone X’s edges, holds three cards, and has a pocket for cash. A folio case is more suitable than a standard wallet case for storing cards and cash and charging wirelessly. Twelve South’s Journal is the best folio case for iPhone X. Many folio cases on the market are either poorly designed and manufactured or have annoying closure mechanisms. The Journal doesn’t have any of these problems. Full leather, full protection, and a 3-slot wallet. The Journal is an attractive leather case. It covers the iPhone X’s edges and includes full button protection. The cover lies flat against the screen. The folio case holds three cards, including a see-through ID slot, and has a pocket for cash. The price is higher than many cases on the market, but you pay for quality. All folio cases are bulky, so is the Journal folio case. While the premium materials and craftsmanship are worth the price tag, the case is more expensive than its competitors. Designed with elegance and functionality in mind, this wallet case is made with natural leather skin and a detachable inner shell. 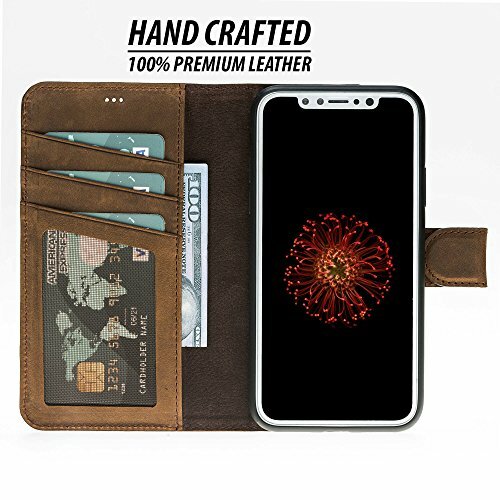 Burkley has recently released this new magnetic detachable leather wallet case for the iPhone X. The slick book-style wallet was crafted by European artisans using handcrafted Turkish leather. Made of impact-resistant polycarbonate, the magnetic snap-on case provides complete protection by itself. The wallet’s rubber finish and leather details protect the iPhone X from scratches and smudges inside and out. The New York fashion house designed the new case with elegance and functionality in mind. It is made with natural leather skin and a detachable inner shell. The wallet portion has three card slots and a pocket for cash and small papers. Despite being magnetic, the new case is compatible with Qi wireless chargers and universal car mounts. It also incorporates a magnetic clasp that doubles as a stand when opened. Burkley’s new iPhone X case allows full convenient functionality with a class of its own. The Nodus Shell is a magnetic iPhone case that lets you dock your iPhone X almost anywhere. How? The case has a built-in magnet shielding and can stick on the magnetic Micro Dock (sold separately). You can dock your iPhone on the dashboard in your car, or on the wall above a power outlet for charging. The magnets hold firm but are easy to take apart. The vegetable-tanned Italian leather gives the case a premium look and feel. The leather is thicker than other leather cases. It tightly holds the iPhone X in place. The openings on the top and bottom of the case expose your iPhone, so the case doesn’t have a full coverage. The buttons are easy to press. It is one of the expensive iPhone X cases on the market. The price point puts the case in the luxury category. Elago’s Genuine Leather is an affordable choice in the genuine leather category. It is made of authentic Italian cow-hide leather. The openings on the sides and bottom give you easy access to all buttons and ports. But at the same time expose your iPhone X to impact damages. The lip doesn’t fully cover the top of the iPhone X, unlike its competitors. The case can hold two cards on the backside. Willnorn’s PU leather case has a leather back fused to a TPU bumper. The full enclosure protects the corners and the bottom edge of your iPhone X. The raised front bezel is tall enough so that you won’t have to worry about scratches when you lay your iPhone X screen-down. Shamo’s PU leather case is one of the cheapest leather-like cases on the market. The low price point doesn’t compromise the quality. The PU leather has a rich tone and a classy look. The soft texture doesn’t make it feel like a cheap PU leather case. The two slanted card slots make it easy for you to slide out cards. The message on the case lining looks tacky and has grammatical errors, but you can ignore it once you’ve installed the case. The downside is that the case doesn’t have full coverage. There are openings at the bottom and around the side buttons. The minimal lip doesn’t cover the top edge of the iPhone X.
Gear4’s Knightsbridge has an impact absorbing TPU bumper wrapped in genuine leather. X-Level’s Vintage Series is simple yet sophisticated-looking. The inside is soft to prevent scratches, and the outside PU leather is soft and supple. The case texture feels smooth but not slippery in hand. The case doesn’t fully cover the edges and buttons of your iPhone. The bottom of the case is open for easy installation and access to the Lightning port. But the slim leather case tightly hugs the iPhone X.
Lopie Sea Island Cotton Series ticks all the boxes. Aesthetically, the mix of fabric and genuine leather gives the case a unique and stylish look. As for functionality, the case is easy to install, has a card slot and responsive metal buttons. As we all know very well that iPhone X is very inexpensive and very sensitive. The best way to protect your iPhone X is through leather case. Leather case fully protect your cell phone and you can avoid dust scratches and many more.